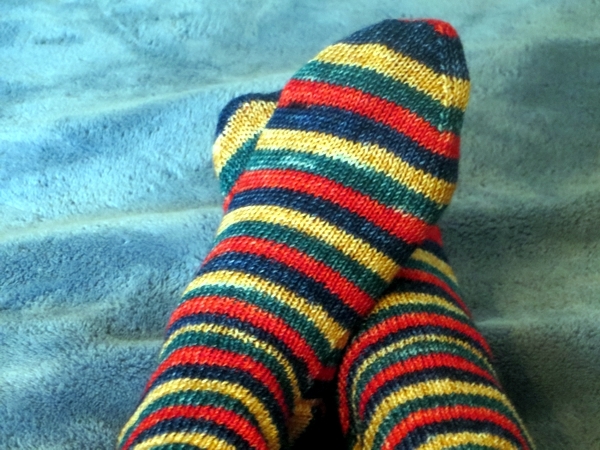 After I got over the ludicrousness of handknitting socks that could otherwise be purchased cheaply and ready-to-wear in a store, the one thing that always worried me about the idea was how to wear a handknit item on my feet. You know, without putting holes right through them. Answer: choose hardy yarn, knit at a tight gauge, and don't wear them on a bare floor. And after that, I worried about how I would WASH them. Would I need a sock blocker? If I washed them by hand, how could I be sure I'd rinsed out all the soap, and what sort of soap should I use? It's actually pretty easy to wash handknit socks. You don't need a sock blocker - I just heave mine over the flat run of a plastic hanger. I don't use soap at all, I use Soak, which doesn't need to be rinsed out (though I do usually run a rinse cycle anyway, because they are socks after all and it strikes me as a good idea to have a little more help removing any odors or bacteria from the fiber.) And I don't do it by hand in a bowl any more, like I did when I had only a few pairs. I use the machine, after I've put the socks into protective bags to save them from any altercations with the agitator in the middle of my machine. You may not have an agitator in the middle of your washing machine in which case you may not feel you need a protective bag, but I like them regardless. It's SO much easier to fish a bag or three out of the machine than a dozen socks, and the socks get less wear in a confined space than if they were rubbing up against each other in a bigger one. The idea is to separate pairs into their own individual pouches, which I think is a bit frivolous and completely fun, because that's how I'm built apparently. Four pockets in each bag means I can now wash 12 pairs of socks at a time if I don't use big bags to supplement the supply, or double up pairs in each pouch, though there is definitely room for that. Honestly, what kind of person has the need to wash 12 pairs of handknit socks in one load - with, one would assume - enough clean socks in the pipeline to cover all foot-warming needs while the 12 pairs dry? But as it turned out I was washing 14 pairs when I photographed this, and opted to tuck the extras on top of already-full pouches. I was too enchanted by the pouch idea to remember that I had more big bags, sigh. I like to fill the washer to the lowest level - enough to cover the wash bags, eventually - and add a squeeze or two of Soak as the water is running, so it all mixes together without agitation. Then I throw in the wash bags, spacing them around the agitator so they're evenly distributed. Then I leave the lid up - no agitation - for anything from the requisite 15 minutes to the accidental 8 hours when I forget I started the process and have no reason to idly pass the washer again until bedtime. Soak is so gentle, my lack of focus doesn't do any harm. When I do get around to the next step, I close the lid for maybe 10 or 20 seconds, just enough for a bit of agitation to push the water through the fibers. Then I advance the cycle to drain the tub and spin dry. You can stop here, but as I say - I usually fill the tub a second time, skip the sitting stage, and advance again to empty-and-spin-dry. Then, when they're done, I simply lift out the bags, unzip them, and hang up the socks for a day or so, depending on how dry and warm the air is at home. What could be simpler? Really, the most challenging thing about handknit socks is KNITTING them. And since that's also the fun part, there's no reason not to. Unless you are Trish, who is firmly anti-sock knitting. She's got way more appetite than I do for giant shawls and scarves though, so I am happy to agree to disagree on this point, heh. Thought I'd close off today's post with a nostalgia shot from the old house. Ahhh, radiators. I haven't lived with one for nearly two years now! and when we move back home, all the radiant heat will be invisible, under the hardwood. I will miss the graceful shapes but not the dry air or floorspace-grabbing. Have a wonderful weekend, even if it involves laundry, and I'll see you next week! thanks for your sock washing tips! I googled the laundry bag is available in USA at Bed Bath and Beyond. 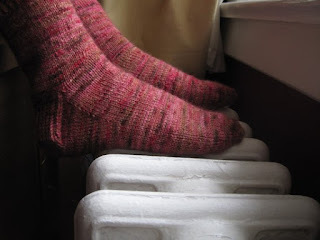 so I will get one and wash my future hand knit socks! thanks again!